Saturday evenings are "free night" at the Getty Center. Admission to the museum is always free, but on Saturday nights they even waive the $15 parking fee, making a great thing even better. 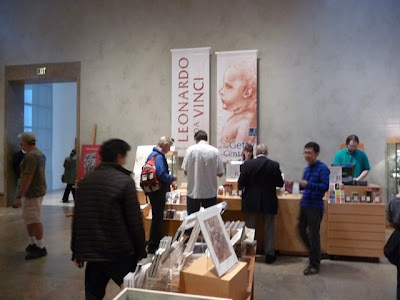 Last month we headed on over to see the special Leonardo da Vinci exhibit. 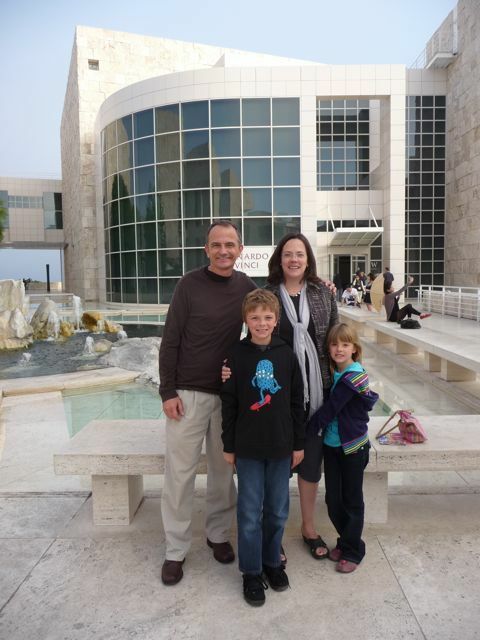 If you've never been the Getty, it's a must visit. 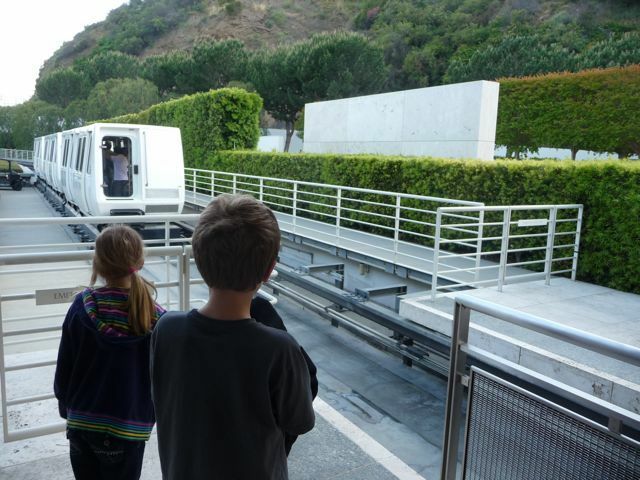 Above the massive parking garage is the tram station for the 1/2 mile ride to the museum. 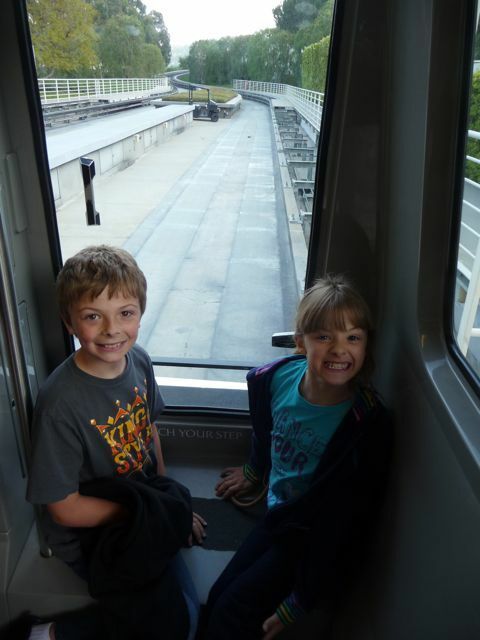 Of course, our kids think this is one of the best parts of a visit, especially if they can score the seat at the front of the tram. No matter where you sit, you'll get great views looking out as you climb the hill. The tram arrives and you head toward the entrance. 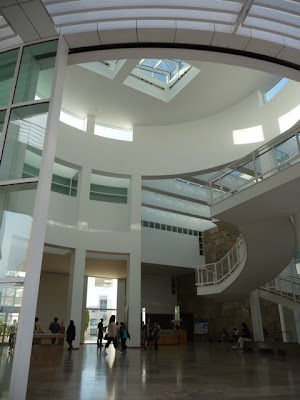 The Getty Museum actually has two locations: the original "Getty Villa" located in Pacific Palisades, and the much larger "Getty Center" located off the 405 Freeway in Brentwood. 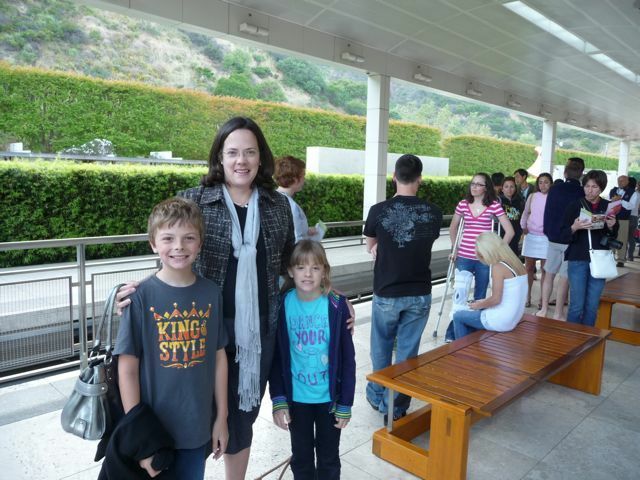 The Getty Villa requires advanced parking reservations, the Getty Center does not. Here's a few thoughts on the Getty Villa from previous post. 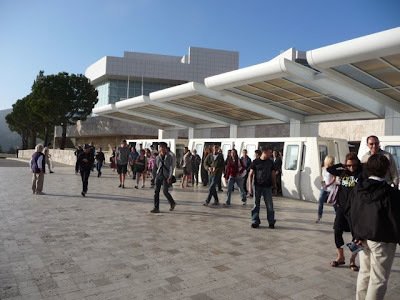 The Getty Center is a series of gallaries centered around a large, open courtyard. 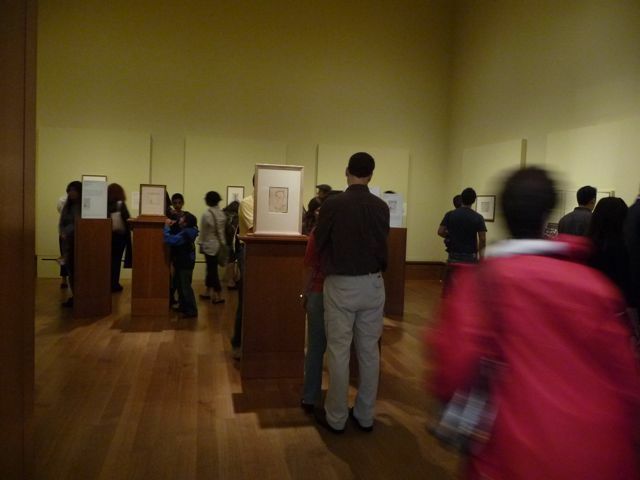 There is a small family room, which is great for younger children. We've taken our kids there many times. 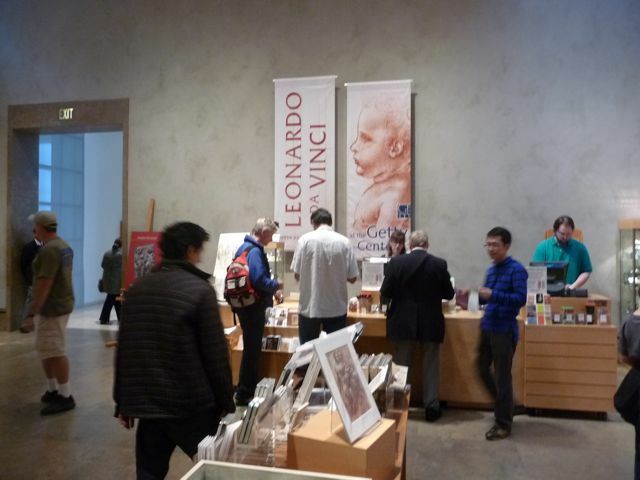 March 23–June 20, 2010 the Getty has a special exhibit featuring the work of Leonardo da Vinci. As I said, that's why we decided to go. 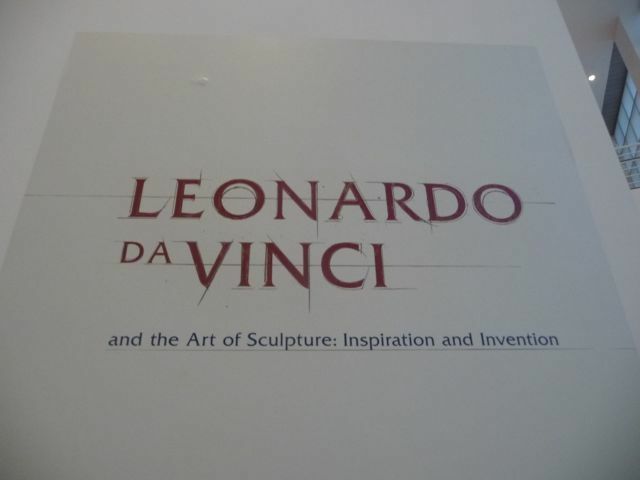 If you want to see the Mona Lisa, you'll need to go to the Louvre in Paris. But if you'd like to see dozens of Leonardo da Vinci's original sketches as well as some of his massive sculpture, then head over to the Getty. 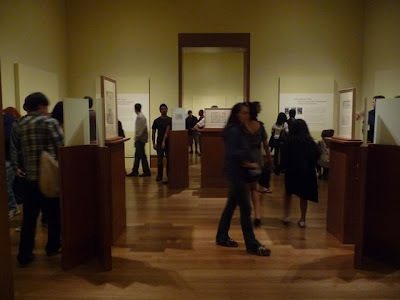 The museum has a very strict "no photography" policy in the galleries. This was just outside the gallery, looking in. That's OK, right? It was an amazing display, and I'd LOVE to go back again and spend more time there - although the exhibit is only there two more weeks. If you're in the Los Angeles area, I highly recommend going. There's a large gift shop immediately has you exit the exhibit. In that sense, it was just like Disneyland. 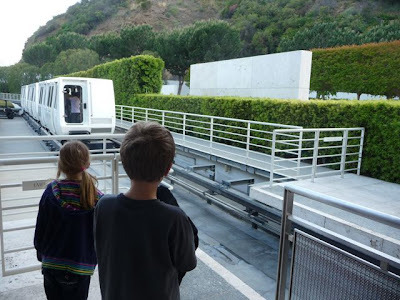 You know, "get off Star Tours and buy a Yoda mask." 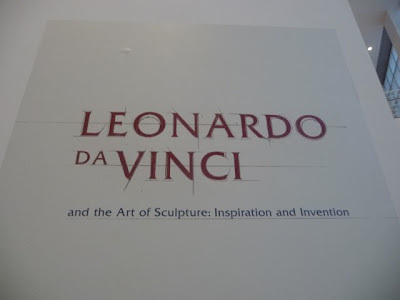 Well, I couldn't take pictures inside the galleries of Leonardo's work. 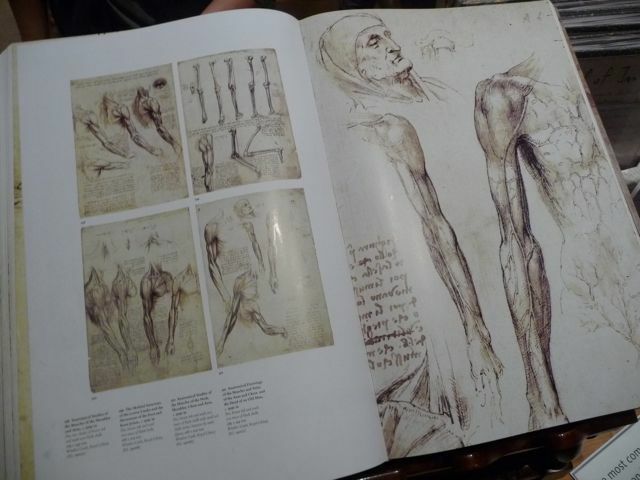 Figured I could take a few from the books inside the gift shop. Wrong. "Sir, there is no photography anywhere inside the galleries, including the gift shop." Time to head outside to the gardens (see Part II) where photography is allowed. i really like your trip , i will travel with my kids this summer too..